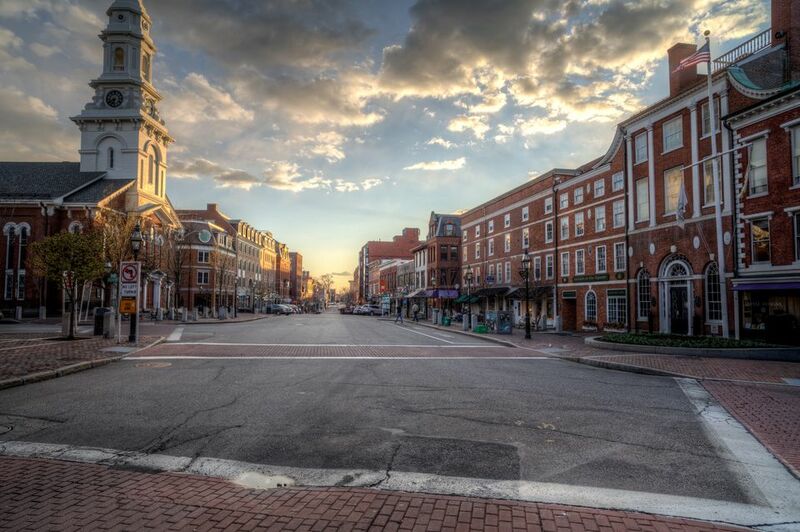 The attractive, bustling seacoast community of Portsmouth, New Hampshire doesn't have much in the way of nightlife specifically geared to LGBT clients, but this generally liberal city of 21,000 does have a sizable gay population. Portsmouth is a popular getaway for New Englanders from Boston (an hour south), Portland (an hour north), or Providence (two hours away). This historic city lies at the northern end of the New Hampshire coastline—conveniently located just off of I-95—with its downtown hugging the shores of the scenic Piscataqua River. Although there are only a small number of gay-friendly bars and restaurants in the area, Portsmouth is full of a number of fascinating museums—notably the Strawbery Banke living history complex of colonial buildings—and plenty of accepting establishments for all types of clientele. A few bars and restaurants in the walkable, historic downtown of Portsmouth do have a bit of a gay following or are at least quite welcoming to the LGBT community. The most popular gay-friendly bars include the hip The Nice, a swanky bar serving sophisticated cocktails beside Dos Amigos Burritos, and Portsmouth Brewery, which crafts a fine selection of artisan beers and serves great comfort fare, too. The Daniel Street Tavern is also quite gay-friendly and offers visitors a laid-back atmosphere complete with a pool table, karaoke, and cheap drinks. It's a bit of a dive, but the crowd is always colorful and often quite diverse. If you're not feeling like drinking alcohol, the coffeehouse Breaking New Grounds draws a diverse crowd for coffee and baked goods throughout the day and evening—in warm weather, grab a table on the sidewalk. Before you go out for a night on the town, you might want to consider visiting one of Portsmouth's many gay-friendly restaurants and eateries for a quick bite, and you'll find a number of excellent choices downtown where you'll likely encounter a warm welcome. The Wellington Room has lovely views over the Piscataqua River while quirky and groovy Lexie's Joint serves terrific burgers (both veggie and meat) and the intimate and fun Cava offers excellent tapas and a Mediterranean wine bar. If it's fresh New England seafood you're after, consider the stylish waterfront eatery Surf Restaurant, which has floor-to-ceiling windows overlooking the river and across to Kittery, Maine. The lobster roll here is superb with its lobster meat warmed in drawn butter and served in a grilled brioche roll; the raw bar also turns out impressive tiered towers of fresh-caught oysters, smoked trout and salmon, and sashimi tuna. Although Portsmouth is relatively small, most of its population is welcoming to all types of guests—gay, straight, bisexual, or otherwise inclined—so no matter where you go, you're sure to have a good time in this quaint little town. However, if you want a bit more excitement, Portsmouth is just a 30-minute drive south of the popular summer beach town, Ogunquit, which is a popular destination for gay tourists in the northeast. Portsmouth is also a little less than an hour's drive east of the state's largest city, Manchester, which has a couple of gay bars including The Breezeway and Element Lounge.